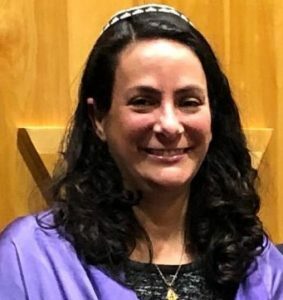 Cantor Stephanie Weishaar has been a familiar face at Oakland Mills Interfaith Meeting House since she became Spiritual Leader for Kol Nefesh in 2014. While she continues to lead and teach our young friends, she has joined us as Bet Aviv Cantor in September 2018. Originally from the Chicago area, Cantor Stephanie moved to Washington, DC, for college. She studied Russian and International Relations at American University and worked for many years in the field of international development. Some of that work was in DC and some overseas, including a year living in Ukraine as the field representative for a Jewish charity in the former Soviet countries. When her children were young, Cantor Stephanie joined a Reform congregation in Montgomery County and volunteered as a youth group advisor, teacher, and (eventually) board president. During that time, she rediscovered her childhood love of Jewish music and began a path to this new career. She returned to AU to study Hebrew, found instructors for voice and guitar lessons, and participated in multiple workshops and conferences for Jewish leaders and musicians. For more than 10 years, she has engaged in independent and group study with rabbis and cantors in the DC area. Along the way, she found the ALEPH Ordination Program where she is currently studying with progressive Jews from around the world via online courses and semi-annual retreats. Prior to working at Kol Nefesh and Bet Aviv, Cantor Stephanie taught music and led services in several Reform and Reconstructionist congregations from Cumberland to Laurel, Maryland. Actively involved in the Jewish music community, Cantor Stephanie is a member of the Women Cantors Network, the Guild of Temple Musicians, and the Washington Area Reform Cantorial Association. She participates in regional choral festivals and helped coordinate a concert at Strathmore Hall commemorating the 75th anniverary of Kristallnacht. She has attended Hava Nashira in Wisconsin, the annual songleading camp created by Debbie Friedman, and Mifgash Musicale at HUC Cincinnati, the URJ summer intensive for synagogue musicians. Cantor Stephanie and her husband, Bobby, live in rural Clarksburg, Maryland. Their daughter graduated from MIT and continues to live in Cambridge, Massachusetts and their son is a junior at Georgia Tech in Atlanta. When she is not working in Jewish music, Cantor Stephanie enjoys watching baseball, going to movies, reading, hiking, knitting, and playing with her dog.